Recently, we’ve blogged about what we’re doing to make it easier to blog at the Government Digital Service, (GDS) our GDS YouTube channel refresh and our use of Instagram. All of these changes are part of the more strategic approach we’re taking to our communications across GDS and part of our plan to tell the story of our work and the transformation taking place across government. Last week we published our first ever communications strategy for GDS. It’s a fantastic milestone for us, bringing together the aims of the organisation and showcasing the value that comms can contribute to telling our story and giving our audiences a say in how we are working. It seeks to engage people in the work of GDS simply and effectively. Our work should be driven by insights and should meet the needs of our audiences. Taking a strategic approach aligns comms to the organisational business objectives, as well as cross-government and Cabinet Office priorities. As a function of the Cabinet Office, we’ve ensured we’re working to best practice as recommended by the Government Communications Service. Having a solid communications and engagement strategy means we can focus resource and effort to ensure priorities are given the attention and time they require. To show citizens and government the benefits to be had through the transformation of services and the role GDS plays in delivery. To show how GDS, in collaboration with other government departments, is using innovative technologies to deliver the services users need and expect when interacting with government. The three themes of transformation, collaboration and innovation may sound familiar: they are the themes we referenced at Sprint 18. They also link into the aims of the Government Transformation Strategy and the Cabinet Office’s objectives. We continually monitor and refine who our audience is and how we can best reach them. This ensures we use the right channel, at the right time, to engage with them. To help us do this we look at where our audiences are already talking about things. It’s much better to go to where the conversation is already happening rather than insisting they come to us. We’re also planning proactive communications based around priority programmes of work, bringing together the work taking place across GDS to give it a consistent voice, message and look. We’ve already seen increased engagement with our content when it’s more strategic and we concentrate our efforts on fewer, better maintained channels, with better quality content. For example, the recent blog post on why GOV.UK content should be published in HTML not PDF received 25,000 unique views within a week and the Digital Marketplace Twitter account has seen engagement double in the past 12 months by focusing efforts on growing this channel as opposed to spreading our effort across multiple channels. The scope of content we are creating and delivering is increasing in quality, focus and impact thanks our our strategic approach. We’ll be working hard to deliver all the communications we have planned for the rest of this year including events, creative content, blog posts and more - ensuring we’re telling the stories that matter to the people who want or need to hear them. This includes a strong focus on internal communications, making sure our staff are well informed and engaged in the work of GDS and can see how the work they are delivering is directly supporting the society we serve. We’ll also be measuring our impact quarterly using the Government Communication Service Evaluation Framework. To allow us to adapt our campaigns on a quarterly basis, this agile planning cycle gives us the ability to be responsive to campaign insights and adapt our approach. Read the full strategy on GOV.UK. For more information you can contact us at gds-comms@digital.cabinet-office.gov.uk. Lucy Denton is the Head of Strategic Communications and Campaigns at GDS. 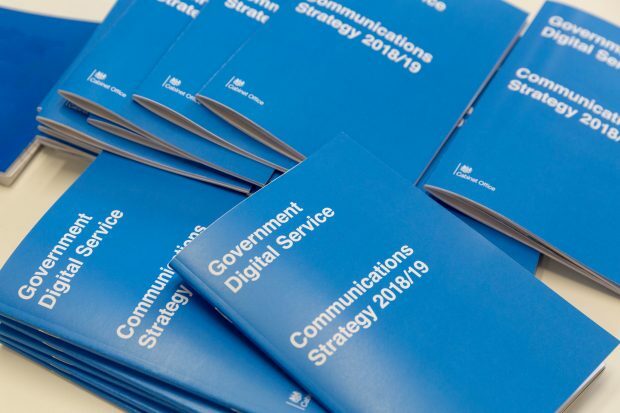 As the Government Digital Service, it's a little disappointing to see that you printed out your strategy into loads of booklets. Surely the people who need to see this strategy are working in a largely paperless environment, meaning that wad of paper is going to be glanced at once and tossed aside. I'm sure the document itself is brilliant, but as a printout, it's a waste of paper. Hi John, As you'll see we have made sure this strategy is available in both HTML and PDF format online, these brochures pictured were printed on a very short print run to meet a specific user need. Good to see a strategic approach. But slightly disappointed that 2 of the 3 strategic themes seem to have been inspired by the GOV.UK 'words to avoid' list. Sorry for the caps - the only way to highlight the offending words. What happened to 'working together'? Hi James, thank you for your comment! You are right that these words are on the GOV.UK list of 'banned words'. These words remain on the banned list because it is preferable to use plain english and, where possible, we encourage people to avoid unnecessarily complicated words in service and guidance content. So when we talk about GDS's strategic direction and government departments learning from change, at events such as 'Transforming Together' we do use transformation and collaboration. However, we will always follow the style guide when engaging our audiences, and maintain context for the language we use. Hi Mike, thanks for your comment! All of our communications is focussed around two-way engagement, that's why the strategy is worded specifically to "engage people in the work of GDS simply and effectively." So don't worry we won't just be broadcasting our work!